The historic Taylor Hotel is an excellent example of Greek Revival-style architecture. Not many historic buildings as old as the Taylor Hotel in Winchester, Virginia, could suffer a partial roof collapse and live to tell the tale. But thanks in part to Historic Tax Credits (HTC), as well as a powerful grassroots movement to save the structure, the Taylor is once again an essential part of Winchester’s vibrant downtown. Bushrod Taylor built the hotel in 1848, replacing a tavern that had burned to the ground two years prior. Its location on the main street of Winchester, which itself sat along the well-traveled Great Wagon Road, guaranteed a steady influx of travelers and stagecoaches looking for a good night’s sleep. When the Civil War broke out in 1861, General “Stonewall” Jackson selected the Taylor Hotel as his temporary base of operations. Winchester was the setting of several major battles in the Shenandoah Valley campaigns of the war, and many buildings in town served as offices and hospitals for Union and Confederate soldiers alike. In its post-war years, the hotel wore a variety of hats. It housed, at various times, everything from a department store to a telecom center. A theater and an accompanying five-story fly tower, accessible from the main hotel building’s second and third floors, were constructed on the same lot in 1923, though it closed after only 16 years. 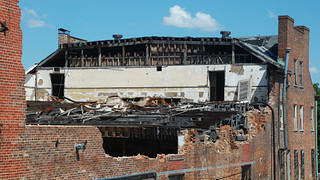 The theater's partial roof collapse in 2007 turned the once-proud property into a community blemish. Eventually, the slowing economy left the Taylor Hotel vacant. Then in 2007, heavy rains caused the theater’s mostly flat roof to collapse, leaving a gaping hole between the fly tower and the hotel proper. The disaster appeared to ruin any hopes of restoration, and Winchester’s City Council condemned the property to be demolished in 2010. “It was basically being held up by a bunch of cables. That’s how bad of a shape it was in,” says Erik Wishneff, vice president of the tax credit consulting firm Brian Wishneff & Associates. What the City Council did not anticipate was the resulting upswell of public support for saving the hotel. The people of Winchester convinced them to explore ways to renovate the Taylor, leading to a partnership between the Winchester Economic Development Authority and Wishneff’s firm to devise a redevelopment plan. An essential part of that plan involved using Historic Tax Credits to alleviate the financial burden. The project received a total of $2.75 million in tax credits, bringing its total cost of $6.3 million down to a workable amount. 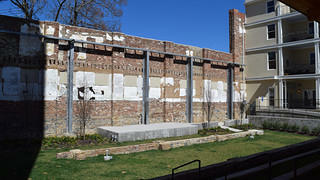 The original side wall of the former theater, now part of the Taylor's outdoor pavilion. Work began on the property in the fall of 2012. The Taylor Hotel and the fly tower were transformed into apartments and commercial spaces, while the ruined former theater space in between became an outdoor pavilion, with seating areas for live performances and a farmer’s market for passersby to purchase locally-grown foods. The renovated structure reopened to the public in August 2014 and was an immediate success. None of the apartments have had a single day of vacancy, and the pavilion is frequently filled with people enjoying the fresh air. 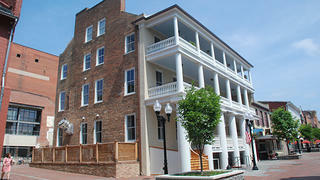 Best of all, the rehabilitation has helped draw residents back to downtown Winchester.